Subaru driver Ben Hunt will start 2019 as the title favourite but he insists a second championship is far from his mind despite the stars not quite aligning for him in recent seasons. Hunt enjoyed a superb year in the Brian Green Property Group New Zealand Rally Championship in 2018 – only overshadowed by the dominance of WRC star Hayden Paddon. He finished second to Paddon in the overall standings and showed a pace that was consistently better than the rest of the field for the most part. A year earlier he was in a three-way battle for the championship going into the last round when mechanical failure ended his chances. In fact since his title-winning season of 2015, Hunt has found himself in the mix every year to add a second championship to his résumé. “It was definitely an awesome season,” the now South Auckland-based driver said. “We were second in a number of rallies and Tony [co-driver Tony Rawstorn] and I had an absolute ball in the car and loved every minute of it. Had luck been on his side a little more Hunt may have two or three championships to show for his efforts – something that would put him on a shortlist containing the who’s who of New Zealand rallying. But despite the situation opening up for him more this year Hunt is adamant he isn’t thinking long-term at all. “I’m not getting hung up on it. Obviously we have won the championship before and come second a few times and third. It would be nice to win another championship but I won’t be that focused on it that you get wound up about it. “I thoroughly enjoyed the last year. 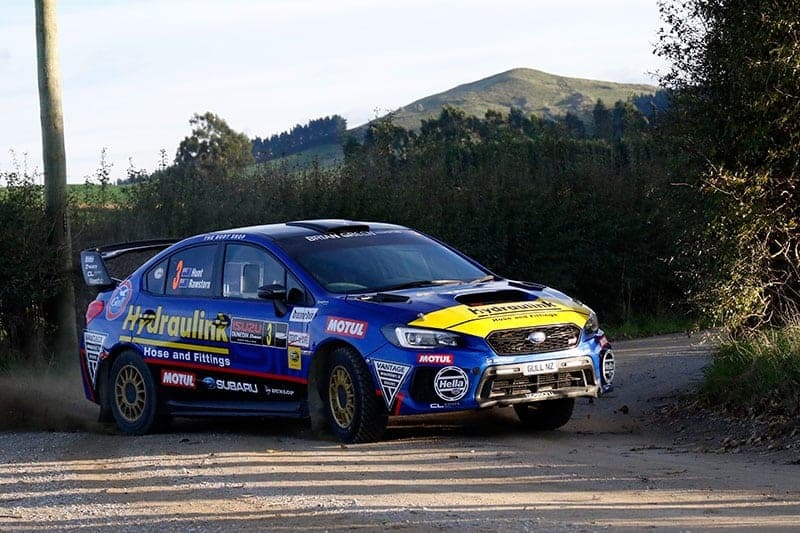 The Subaru that Hunt pilots with Rawstorn has officially been signed over to him from Subaru New Zealand, which was always part of the three-year deal the two parties had. Little will change on that front this year however and Hunt has spent the off-season doing all the normal things to the car that he has each of the past three years. “We thoroughly go through the car, go through every mechanical and electrical piece and check that we are happy with it. We then make it look pretty again with paint. “This year the main thing is putting in shorter-ratio gear box in it so it will be more like an AP4 gear box in that it probably won’t go as fast in the top end but it should be a lot faster overall. Originally Hunt was known for his ability on more technical roads but over the years he has improved his ability on high speed stages and demonstrated that with a powerful performance at Rally Otago 12 months ago. “Otago has some of our favourite roads,” he said. “In the early days I was a lot more suited to the tight and twisty stuff but the fast stuff is something I have developed over time with Tony and the trust in him over the blind crests. Rally Otago gets underway with a ceremonial opening at the Octagon in central Dunedin on Friday night before special stages begin on Saturday morning.